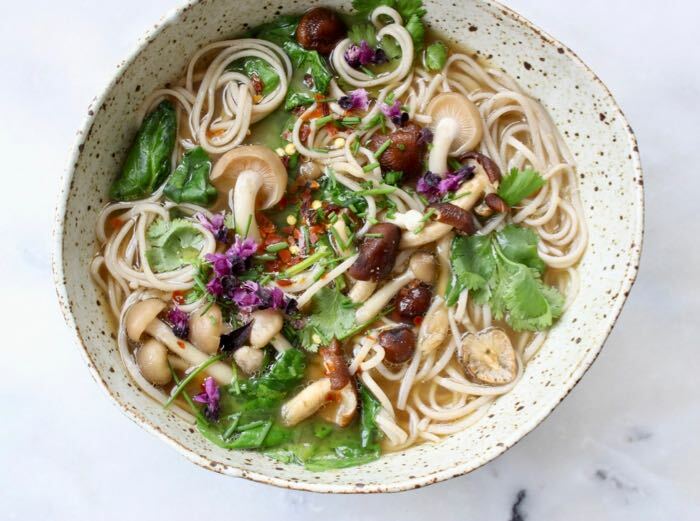 Simple vegan miso noodle soup with garlic, ginger, mushrooms, spinach and buckwheat soba. The most delicious, quick and easy bowl of noodle soup I’ve ever made you guys! I started by making a warming mushroom broth with dried porcini in which I whisked my favorite white miso paste (fermented chickpea paste but you can use soybean paste), garlic and ginger that I then ladled over soba noodles and baby spinach. Oh my! It’s all about that broth! I’ve experimented making the broth with both shiitakes and porcini and I must say the two don’t even compare. If you want rich, earthy, flavorful mushroomy stock then porcini are the way to go. So lovely you can even stretch it out with water If you wanted to and don’t sacrifice the end result. This is a miso noodle soup you can build on! Just add your favorite thinly sliced vegetables, cubed tofu, edamame, bok choy instead of spinach, nori or sprouts and go for ramen or udon instead of the soba noodles. Make it less or more spicy, really whatever your tastebuds fancy at this moment in time. It’s healing, healthy, oil-free and 100% whole foods plant-based. A must make! Is miso soup healthy ? Miso is a fermented food traditionally made from soy beans that provides the gut with beneficial bacteria. A great source of E, K, Folic Acid and B vitamins, but also high in sodium. But according to scientific research (see nutrition facts.org) “ the carcinogenic effects of salt are counteracted by the anti-carcinogenic effects of the soy so canceling out the risk. Plus if you add some scallions to it, it may drop the cancer risk even lower. So sprinkle some scallions and enjoy your vegan miso noodle soup! 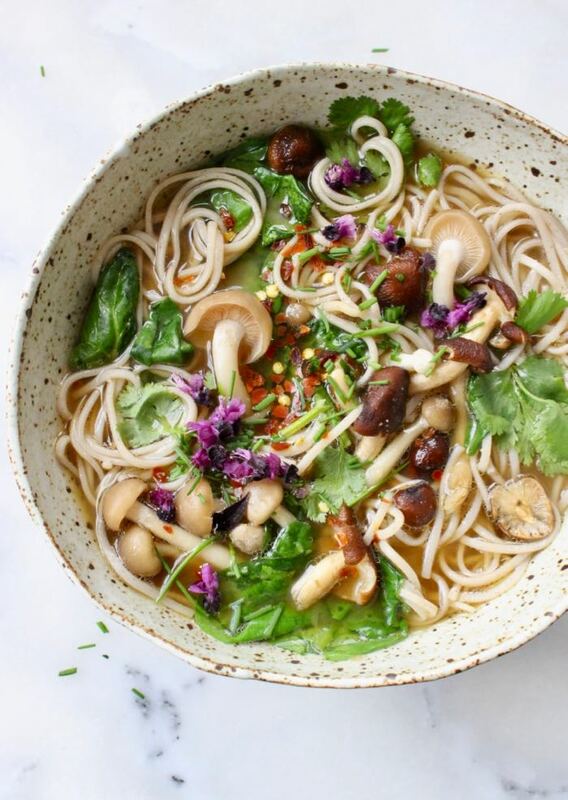 Simple vegan miso noodle soup with garlic, ginger, mushrooms, spinach and buckwheat soba. 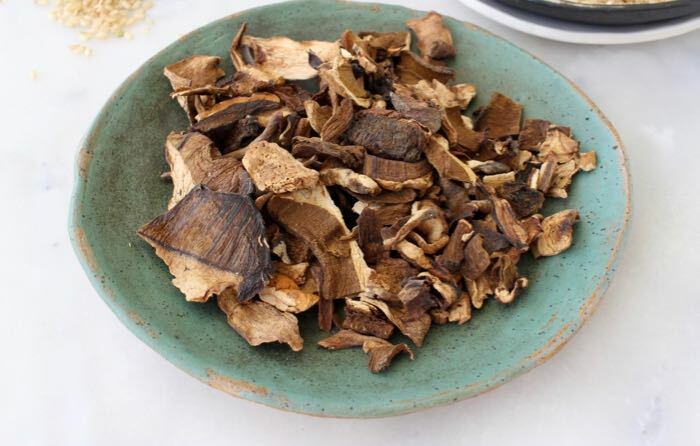 Place the dried porcini mushroom in a medium sized bowl and cover with the hot water. Allow it to sit for 30 minutes. 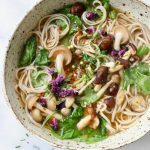 Strain into a saucepan and reserve the mushrooms for another recipe or to add back into your noodle bowl when serving. Bring the mushroom broth to a gentle simmer and stir in the mushrooms, garlic and ginger. Remove from heat. In a separate bowl whisk together the miso paste with a ladle of the hot broth. Once incorporated add it to the pot with the soup together with the tamari or coco aminos. Meanwhile cook the soba noodles in a separate pot until al dente. Mine take less than 4 minutes to be done just right. 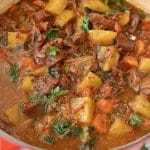 (Do not cook them in the mushroom broth as they contain lots of starches that will cloud the broth and throw off its flavor). Divide the noodles between 4 bowls and top each with some of the baby spinach. Ladle the mushroom soup with the mushrooms on top and garnish with the cilantro, chives and chili pepper to taste. Serve hot. 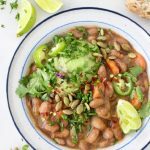 Made this as soon as I saw the recipe and it was delicious .i didn’t have coco aminos so I just used soy sauce and added extra garlic. Great recipe! Excellent! 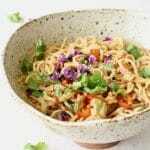 This is my go-to ramen recipe; it’s fun to try different toppings! That’s fantastic Kathie, so glad to hear. I’m about to go make me a bowl right now and add some tofu into the mix.